Syracuse Moscow Ballet Host Studio Owner Cathy Napolitano-Mucci, Dance Center North, has hosted Great Russian Nutcracker auditions every year since 1993! ~ “Thank you so very much for working with Midway ISD! You and your crew were absolutely wonderful to work with and “my” hodgepodge crew of college students had an exceptional and educational experience. I appreciate your willingness to work with young people who are considering Theatre or Technical Theatre as a profession. There were several in the crew who had expressed a new excitement about what working professionally could be and how they may pursue a different track in their education. Most are university students and only get to work on one major production per semester and being able to have real responsibility and see the immediate “fruits of their labor” was quite a thrill to them. I know that they all benefitted from your expertise as well as your patience. ~ “I cannot thank you enough for allowing our students this opportunity. It was truly magical for all! The children were mesmerized and enthralled by this performance. They were literally grateful for every "opportunity" to applaud the performers. At the start of the performance they were cheering out-loud with great enthusiasm. Their teachers redirected them to clap, which they did. By the end of the show, they were so excited, they reverted back to their out-loud cheers. It was precious!At the end of the show, an older patron approached me to say "The best part of the show was watching our student's pleasure! ~From all of us at Fleur-De-Lis Academy of Ballet in Louisville we are sending you a huge thank you! What a fantastic experience from start to finish. The students are still on cloud 9 from being backstage and onstage with such talented dancers as you have. Their inspiration tank has been filled!The professionalism from MB was everything our students needed to see in order to realize exactly what it is like at the professional level. Working with you and your team was seamless in every way. We received tremendously positive feedback about the performance from audience members. Over and over we heard how vibrant the production was, how high the quality of the costumes were, and how the dancing was mesmerizing. For those who had seen other productions, but were not necessarily educated in ballet, they commented that they appreciated the production because they got to focus on the actual dancing and not technical tricks. They said that the dancing was so outstanding. Thank you for bringing the magic to Louisville! Merry Christmas, and best wishes for a wonderful 2016! Our son Benjamin had a great experience playing the violin solo for the Dying Swan for the beginning of the December 24 Great Russian Nutcracker in North Charleston. It was a magical experience for Benjamin, and we thought he played his best. What a beautiful show! Everything was so pretty, and I’ve never seen such lighting effects. In some scenes there was SO MUCH going on it was amazing. The local students were very well prepared and looked great in the lovely costumes (and I include the mice in “lovely,” because I loved their costumes!). Callers and visitors continue mentioning how much they enjoyed it, too, and refer to the professional dancers’ training, flexibility, skill, and talent. Congratulations and hope the tours continue to go well! Thank you for inspiring my career path! Hello! My name is Caroline Smouse and I am a junior fiber major with concentrations in illustration and experimental fashion at the Maryland Institute College of Art (MICA). I also danced with the Baltimore children's cast in the Great Russian Nutcracker for seven years which brings me to message you. Arthur Oliver’s work is ultimately what inspired me to study costuming! I was always so blown away by the intricacy of the costumes and the glorious way they move on the bodies of the performers. The Dove costume is absolutely breathtaking and I remember dancing as a Snow Maiden alongside the Dove and being absolutely memorized. These costumes became such a huge part of my creative development and I wanted to thank you for being such a huge inspiration. It was an amazing experience for Eric and our family. Thank you so much again for giving the chance to him to accompany the Principal Ballerina and taking care of all the process. I want to say to we appreciate all the staff who supported Eric as well. Our studio was honored to be able to participate in the Great Russian Nutcracker with the Moscow Ballet. It was such an amazing opportunity for our young dancers to learn and grow and see how a professional company works. We loved the fact that the original Nutcracker was used and the costumes were breathtaking. Everyone we worked with was wonderful, we appreciated Olga, Mary and Maria especially. We have to especially brag on the US Costume Director Laura. She was the most helpful person we could have asked for. Very organized, friendly and on top of everything. We can't wait to participate in the show next year, our girls are already talking about what parts they hope to get! Our event with Moscow Ballet dancer on Tuesday was just wonderful. We had approximately 50 in attendance, 15 of which were young dancers. Olena was so wonderful with the girls, and such a beautiful dancer! What a magnificent performance!!! One of the most wonderful nights of my life (and I'm 65). I can only think of 2 other events I've attended come close, but can't surpass your fabulous dancing. The costumes, the backdrops, all spectacular! Brava! Bravo! Thank you! I saw Great Russian Nutcracker at The Sharon Performing Arts Center in The Villages, Florida on Monday November 9, 2015 at the 5:00 PM performance. I expected the show to be professional and colorful, but you far exceeded my expectations. The dancing, costumes and quick changes, the backdrop scenery changing, the snow, the toys, the colors the pageantry, the whole thing was magical and intoxicating. Please feel free to use all my words on your web site. I am still just bubbling over with excitement (like a 65 year old kid)! I can't believe this was only the first week [of the 2015 tour]! It was superb-I enjoyed every minute. Please tell everyone how much my friend and I enjoyed it. Everything, every minute, every one. We're assuming the little ones were local? They were so cute. It was just fabulous. Kaydee was a student dancer in the Great Russian Nutcracker performance at the Tennessee Theatre in Knoxville and this was her first year being able to audition and perform in this production. It has taken several years of her dancing for her to be able to work up to this point, she is a Cancer survivor of Leukemia. She was diagnosed at 3 years old and underwent 5 tedious years of treatment. Once she had been off treatment and got to get back to living life, when Kaydee left each class she thought she was a dancer on Broadway. I think being treated like she was just one of the girls after what all she had been thru just lit a fire in Kaydee, she began to Live to Dance, literally. It’s awesome what ballet has done for her, although she has gotten in trouble at home for dancing in every room in the house, at the grocery store, even at the doctor’s office, she didn't care! That's why after several years of her begging me to be a part of your show~~~ I finally gave in because I knew she could put in the time and effort that was required to perform and not let her fellow dancers down by not having what it takes. And she did it, she and I both cried from being so happy. She had proved to herself that she could dance with the Best of the Best, and she did....beautifully I must say. That is a memory she will NEVER forget, Kaydee is a perfect example of someone who has overcome a life threatening illness and prospered and thrived because of her love for Dance. The Musical Wunderkind – Choir was a wonderful experience for the kids. Most of them had never seen an entire Nutcracker production, and the ones who had, had never seen a professional production. It was excellent. At the time you and I talked about it, I didn't really fully appreciate the gift it was to have the kids see it. I do now, and thank you for that. Their parents were also thrilled with the performance and very proud of our kids. So I thank you, and the Moscow Ballet, for this opportunity. It is a good collaboration to offer young people. Spanish Variation Soloist What an AMAZING show! I would go see this again if it was playing tonight! It was that good! We just finished tonight’s performance of the Great Russian Nutcracker...I loved the dancing of the Moscow Ballet dancers; I loved the sets and I loved the costumes! All in all it was a great experience as usual and the kids REALLY enjoyed it. Thank you for all your help and support these past months...you are very patient and kind! It has been a pleasure working with you and we hope to work with you again next year! Thank you! Paducah appreciates Moscow Ballet's support of the Paducah based Guess Anti-Bullying Foundation and their education efforts. 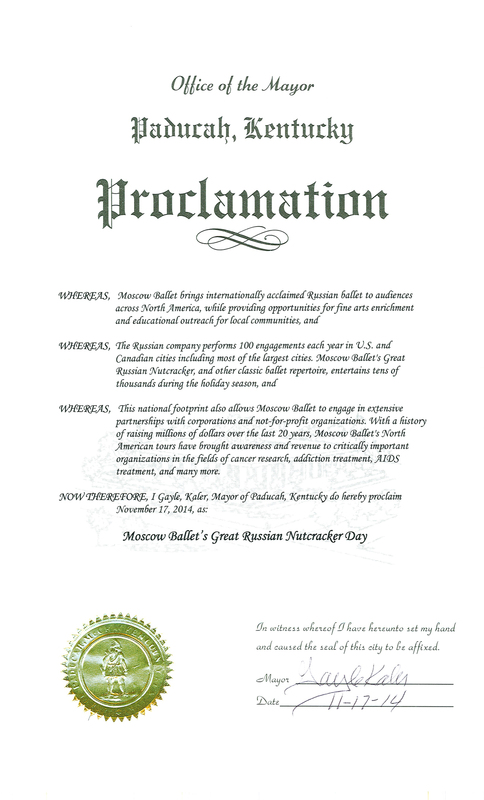 To mark this occasion, I proclaim it Moscow Ballet Great Russian Nutcracker Day in Paducah. My son-in-law bought tickets and sent me with his wife to see Moscow Ballet's Great Russian Nutcracker. What a glorious performance of grace, technique, physical prowess, and amazing story. I totally immersed myself into the opulence and grandeur. It has been decades since I've felt the thrill of this kind of energy and joy of creativity! The Mother Lode Theater in Butte was the perfect hosting location of your splendid performance. Sharing some humor, where else but in Montana will you hear cat calls and whistles of delight from the audience at a sophisticated production. WE LOVED IT!! Thank you for the beauty - the unequaled skill and devotion to the art - and the absolutely flawless execution of ballet and physical stamina. I feel quite blessed to have been a part - even if only in the audience - of this fantastic evening. "We met with the kids for seven weeks of practice and it was one day the kids got to rehearse and perform at Cleveland Music Hall with the professionals. It was an experience you couldn't put into words. It was amazing." The performance went wonderfully tonight! I was so excited and honored to be performing with the principal ballerina [as Moscow Ballet Musical Wunderkind!] My family and I also very much enjoyed the show afterwards. What phenomenal dancers, costumes, and settings! Thank you so much. Thank you for all that you have done to make the Moscow Ballet event happen. Wow! What a job! Svetlana…did a great job with the students. Parents have told me that it is all their children would talk about when they picked them up from school. I wish you could have seen the eyes of the children and could have heard the squeals and applause. Please know how much everyone in our school district appreciates this marvelous experience. Thanks again! "I thought the experience of having a first class ballerina modeling was very special for all the different majors involved. Svetlana was a hit with the drawing and photography students. It was a thrilling and professional interaction between the ballerina and the students. I'm looking forward to the Moscow Ballet and MICA participating in another terrific collaboration." "We hope you take pride in your contributions to the world of ballet, and we appreciate your thoughtful gesture." "We were so pleased with the results of this day of immersion that we are bringing four Moscow Ballet dancers to the PLACE centers for 6 weeks this summer where we will expand to a full week of immersion for every PLACE child in Pasco County!" "The 1835 House at Recovery Acres strongly reccomends this program to any and all charitable organizations looking to raise money for a good cause or simply make headlines for their group." "The Event was terrific, great seats and our supporters thought the event was a remarkable performance." 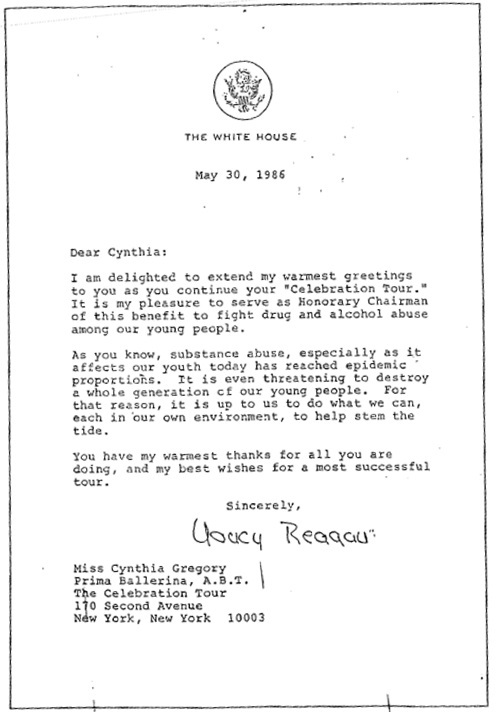 "On behalf of Mrs. Reagan, I am pleased to inform you that the First Lady has accepted yout thoughtful invitation to serve as the Honorary Chairman of "Cynthia Gregory The Celebration Tour." 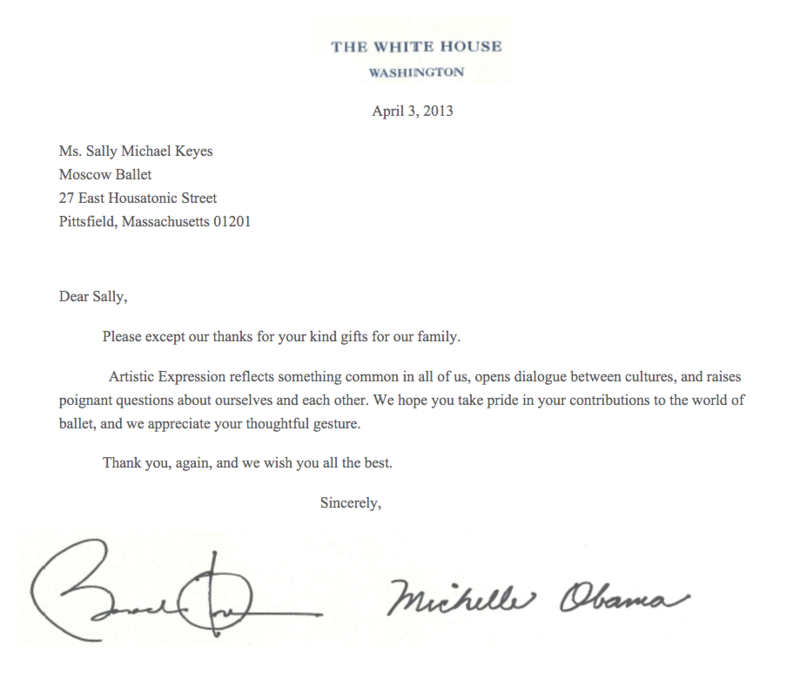 "I am Delighted to extend my warnest greetings to you as you continue your "Celebration Tour." It is my pleasure to serve as Honorary Chairman of the benefit to fight drugs and alcohol abuse among our young people"